Inside San Quentin, Inmates Go To College The Prison University Project at San Quentin State Prison organizes volunteer instructors from schools like UC-Berkeley and Stanford, who conduct classes inside the prison walls. Inmates can earn degrees, and in the process, help bring calm to the once-notoriously violent prison. 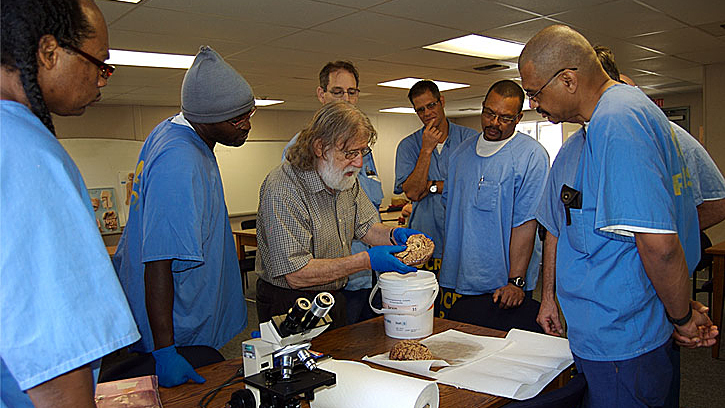 Charles Gross, a neuroscience professor at Princeton University, looks at a sheep brain with students at San Quentin as part of an Introduction to Biology class at the prison. Correction officials in California see San Quentin State Prison, once a notoriously violent place, as a model for reform at a time when the state's prison system is in crisis. It's under a U.S. Supreme Court order to reduce its overcrowded facilities and continues to cut rehabilitation programs for lack of money. San Quentin's model is centered around some 3,000 community volunteers who conduct about 70 inmate programs, ranging from self-awareness groups, to veteran activities, literacy classes and even the opportunity to go to college because of a program called the Prison University Project. The Prison University Project is the only on-site, degree-granting college program in the state's prison system. There are well over 100 teacher volunteers from schools such as UC-Berkeley, Stanford and San Francisco State. They go through three security checks to get into the prison. And then they hold classes in a nondescript trailer overlooking the prison's baseball field. 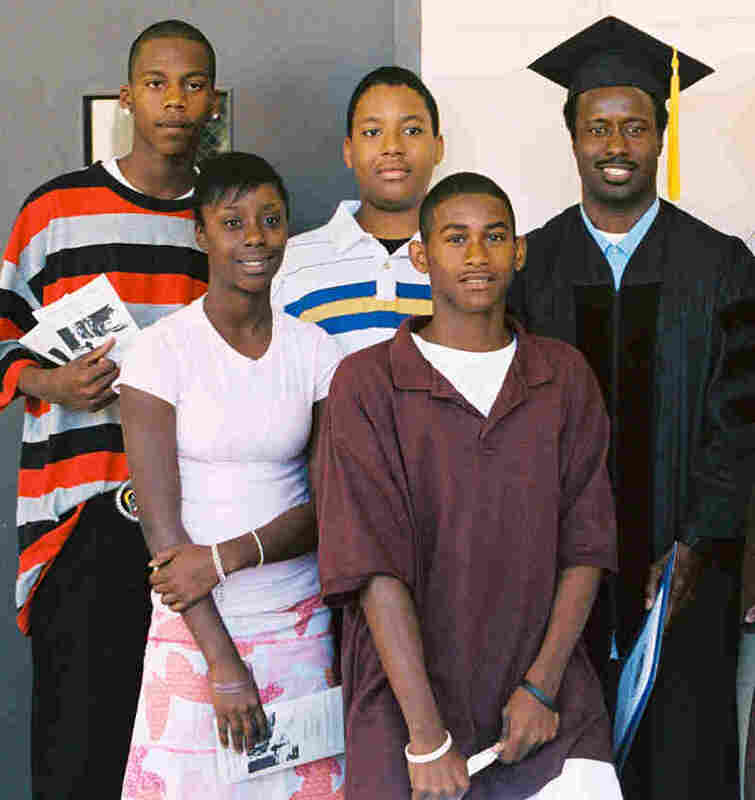 Phillip Senegal (left) and valedictorian Felix Lucero earned associate of arts degrees in 2009 at a ceremony in San Quentin state prison, where they are inmates. The college program is an extension of Patten University in Oakland, Calif. The program started in 1996 with two volunteer instructors. The program grew. But in 2000, its part-time coordinator quit. One of the volunteers, UC-Berkeley graduate student Jody Lewen, thought if nobody took the program over, it would fold. So she agreed to do it, thinking it would only be temporary. That turned into a full-time commitment. Lewen decided she had to create an independent non-profit to raise funds to keep the program strong and stable. The project operates with no state or federal funds. Today, 320 inmates are enrolled in the college program that could earn them an associate's degree granted through a partnership between the Prison University Project and Patten University, based in Oakland, Calif. Two of this year's five graduates have been paroled. There are often tough questions for Lewen about the program, like whether it's fair that people in prison have access to higher education when others do not. "I completely understand," she says. "But that's not an argument against educating prisoners. It's an argument in favor of universal access to higher education." Lewen feels she is helping to make up for the educational shortfall and hopefully, having a profound effect on the lives of these inmates. Chris Deragon was still a high school senior when he committed a robbery and was an accessory to murder. He has served 15 years and won't be eligible for parole for another seven. Deragon says taking college level courses has changed him in ways he couldn't have anticipated. "We're in prison, so we're trapped in this bubble. And there's no way to expand outside of the bubble. And this allows you to do that," Deragon says. "I have a professor from Berkeley teaching me how to grow my mind, how to read something and actually understand it. It helps me immensely as an individual and hopefully one day when I get out of prison, as a member of society." Does that mean he's only doing this so he can get out? "I understand that point of view. Most people believe that I'm being punished and that I shouldn't have the right to an education. But at the same time, if I'm released onto the street and I'm not educated, then you're just releasing another criminal," he says. Scott Kernan, who manages day-to-day operations at California's 33 adult prisons, says the college classes and other programs are important not only for the inmates. "You give them something meaningful to do, something they are engaged in, something that is exercising their mind, then it becomes a safer place for staff," Kernan says. If inmates are idle, he says, there's a much higher chance of violence. San Quentin certainly experiences the violence. In May, there was a riot in a wing of the prison dedicated to the short-term inmates awaiting transfers to other state facilities. They don't have access to the college or other programs. But the general population is encouraged to participate. Among that group, which numbers around 1,800, there are far fewer incidents. Bobby Evans Jr., who is not eligible for parole until 2020, earned his degree at San Quentin five years ago and now tutors other inmates. "I've seen guys transfer in from other high-level prisons and they come in with that mask," says Evans, who says he came in with that hardened attitude, too. He says it takes time for new arrivals, even those not in the college program, to get used to the calmer atmosphere at San Quentin. "In a couple of weeks they start opening up, because it's different," he says. "The racial tension is less. We start valuing things, and we don't want to destroy them. And so it's a life-changing thing." The program may be helping to change attitudes inside the prison, but there are no rigorous studies yet that show, for example, if the program helps lower the state's high recidivism rates. The evidence of the program's success is largely anecdotal — and reaches outside the prison walls. Desiree Lucero is 17. 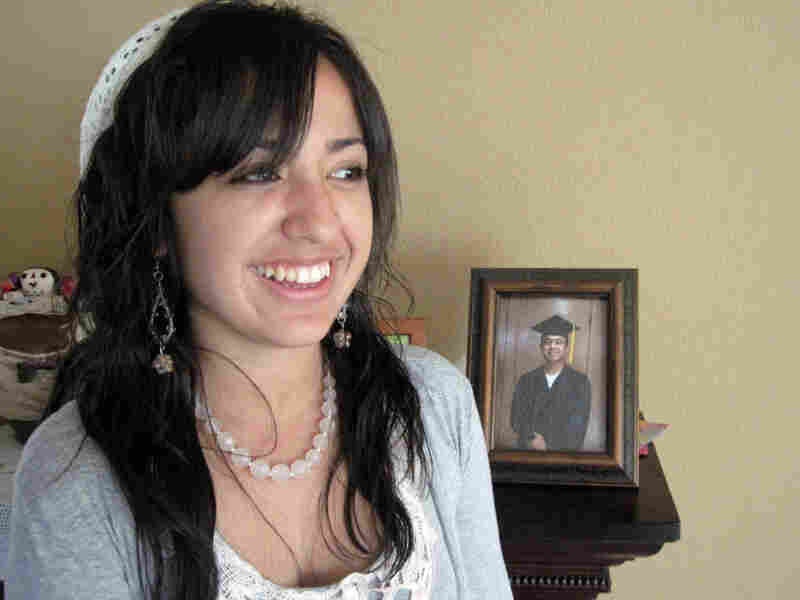 Her father, Felix Lucero, went to prison when she was just a year old. She sits in the kitchen of her grandmother's home in Stockton, Calif., about 90 miles east of San Quentin. "I guess you could say that he 'found' himself in prison," she says, "because now he's a smartypants." Desiree Lucero, 17, is inspired to go to college by her father, Felix, shown wearing the graduation cap and gown in the framed photo. Felix earned his Associate's Degree from San Quentin's college program in 2009. He has been incarcerated since Desiree was a year old. Felix Lucero, 32, was the first juvenile from his county to be tried as an adult for his part in a gang-related murder. Lucero's eyes flash as he talks about his transformation after he arrived at San Quentin. "I'd just come from old Folsom, around two years [in] lock down. I'm just kinda learning how to re-socialize and then boom! I'm in this classroom that has teacher aides, people discussing Sartre and different philosophers," Lucero says. Lucero says going to school changed his relationship with his daughter. "The more I learned stuff, the more I wanted to give it to her." "And he'd talk about a book I should read," Desiree says. "He wants me to read Life of Pi. I'd like that. I'm not a straight-A student, and I had my downfall in high school. I figure I can still do what I want to do. Look what he did." Desiree is setting her sights on community college, perhaps becoming a nurse, inspired by her father's graduation — as valedictorian — two years ago. "He's gotten so far from where he started — a 16-year-old boy. It's like watching him grow in a way. He's watching me grow, but I'm watching him grow, too," she says. Felix Lucero is eligible for parole next year. There are no guarantees he'll be released and fewer guarantees that he can find work as an ex-con. But Lucero and other student inmates may have taken an important step, says program director Lewen. They are helping break a disturbing intergenerational cycle. "Undereducation, poverty, unemployment, crime, incarceration — that goes on and on for generations," Lewen says. "Our students' kids have a 50-percent likelihood of going to prison." Even if its success is hard to quantify, one thing is certain. Not long ago, California spent about a billion dollars on rehabilitation programs, but that budget has been slashed by 60 percent. Lewen knows that state prison officials are looking to her model. "They are in an increasingly desperate situation, and they are now finally, after all of these years turning to us and saying 'How can we help you?'" Lewen says. Just this year, Lewen was allowed to increase the number of classes offered a semester from 12 to 20. Still, the big question is, can the program be replicated elsewhere in the state? Or, will the Prison University Project remain, as Stanford criminologist Joan Petersilia describes it, "A little gem amidst a system that seems totally out of control."